David George becomes the new director for Mini UK, with effect from 25 January. George succeeds Chris Brownridge who has now moved into the role of sales director, BMW UK and will oversee BMW brand sales in BMW Group’s fourth largest market. David joins Mini UK from his previous role as sales director at Mercedes-Benz UK. He brings substantial experience gained across sales, marketing and aftersales from a career in the automotive industry which started at Volkswagen Group in 2000. 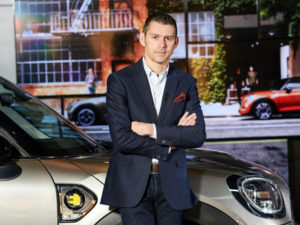 Commenting on his appointment, David George, director, Mini UK, said: “I first fell in love with the brand at the age of 21 when a friend and I travelled across Europe in a Clubman which we had restored. I have long since admired the Mini range after the launch of the Mini Hatch in 2001. In 2017, Mini’s UK market share grew from 2.56% in 2016 to 2.68% in 2017 with 68,166 vehicles sales, thanks in part to new Mini Countryman and Countryman PHEV models.